Friday was a very early day for those in Rolla. 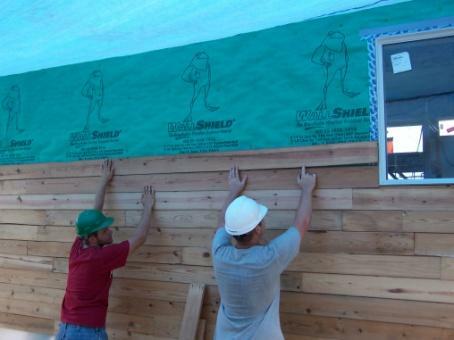 We started construction at 5 in the morning so we could get some of the siding on the house. I don’t want to say anything terrible, but I don’t think the siding matches the look we were trying to go for. But what can I say… I am not an architect. Everything started out well until it started raining about 7 a.m. We hurried to get most of the tools safe in the trailer or house, and in the process Dominic got a little shock… but is OK. Thank goodness the rain only lasted about 15 minutes. After the rain we were able to get back to putting the siding on the house. 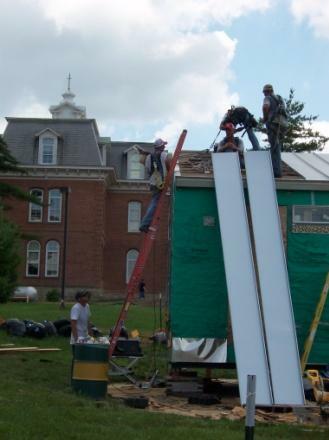 At around 8 a.m., Missouri Builders Service, Inc. arrived and began installing the roof. Yes, we do have a roof finally. I am glad everyone on the site was wearing their hardhats, because the roofers were tearing up the roof felt and just dropping it off the sides of the roof. They worked hard all day and were finished by 12:30. After lunch, we decided to try and make a temporary tent over the area we were going to be working at. We used a tarp, the side of the house, and two ladders. It kind of worked, but there wasn’t much of a breeze, so it was still pretty hot. The team worked until about 4:30. 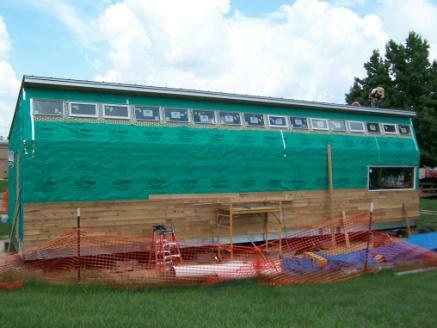 Although we didn’t finish the siding, we did get a lot of it done. We would have gone a little further, but we ran out of nails and decided to call it a day. I want to thank everyone who was out there on Friday for all of their hard work and dedication.